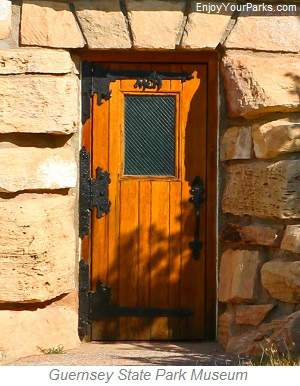 some outstanding examples of legendary Civilian Conservation Corps (CCC) "Rustic Architecture". 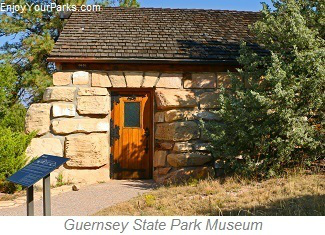 One of these amazing structures, the Guernsey State Park Museum is now a National Historic Landmark. Another notable historic structure located at Guernsey State Park is known as "The Castle". 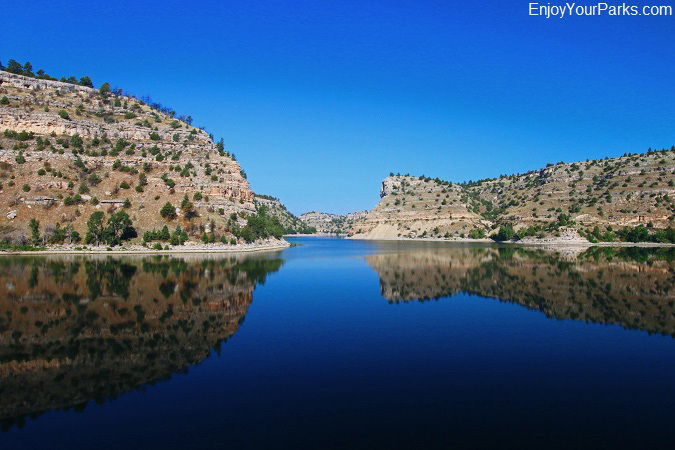 Built in the 1930s, these historic buildings are made of stone, logs and iron, and became the prototype for the entire nation's recreational areas surrounding the reservoirs and dams of the Bureau of Reclamation. 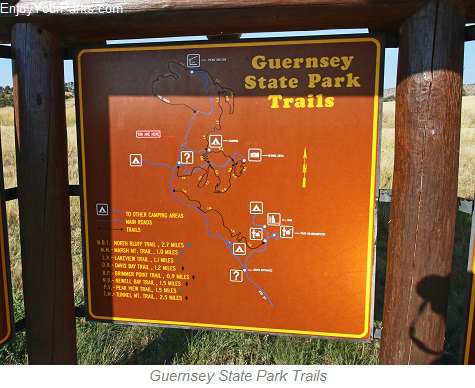 Guernsey State Park was the nation's first cooperative project between the National Park Service, Civil Conservation Corps and the Bureau of Reclamation, and it's tremendous success became the template for all future facilities throughout the country. The architecture is known as "Rustic Architecture", which is based on simplicity of design, and using native building materials. The Sitting Bull picnic shelter in Guernsey State Park is a another classic example of this type of architecture. 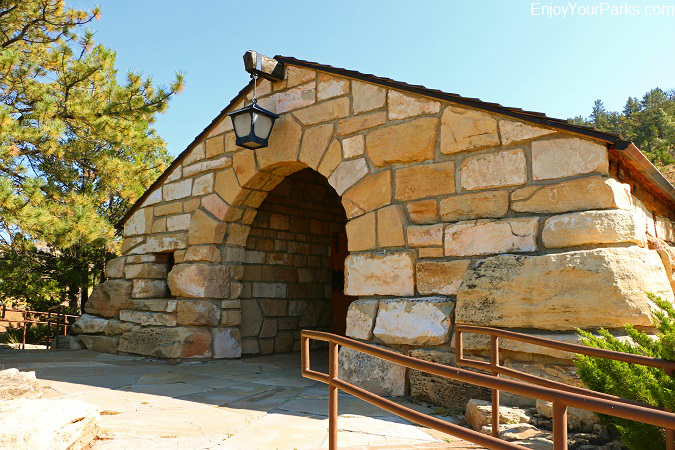 The Castle picnic shelter, which is also one of the historic structures in Guernsey State Park, is probably the most elaborate picnic shelter in the nation. 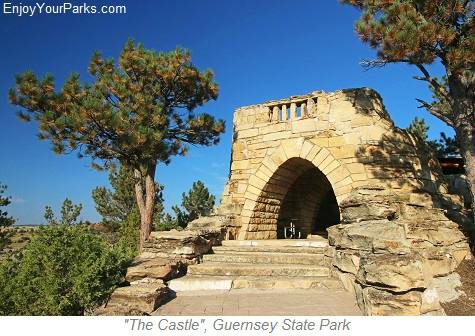 Seeing these historic structures are alone worth visiting Guernsey State Park. The Guernsey State Park Museum building was built in 1937, and its displays have remained essentially intact and unchanged ever since. 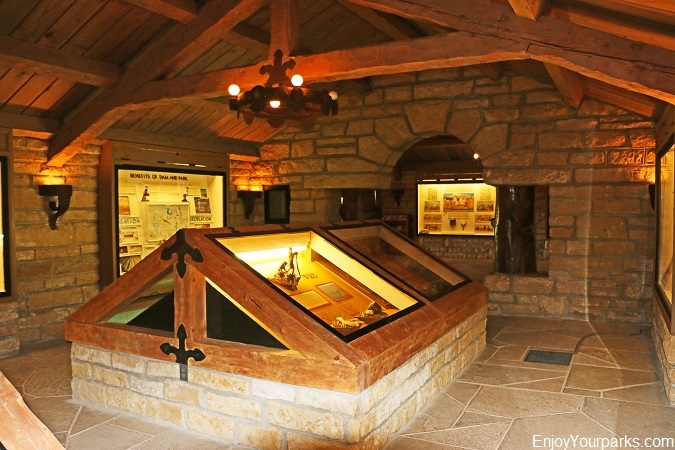 Therefore as you walk through this amazing museum, you are literally walking back in time! Because of this museum's historic significant, as this was used as a model for many future massive and popular National Park Service structures, the Guernsey State Park Museum was designated a National Historic Landmark in 1997, separate from the Oregon Trail Ruts National Historic Landmark. Built with stone and masterfully crafted with hand-hewn timbers and hand forged iron, it's astonishing just how perfectly this historic museum "fits" with it's natural surroundings. The Guernsey State Park Museum is worth visiting this wonderful state park, let alone all the other things Guernsey State Park has to offer. And by the way, the Guernsey State Park Museum is built on the edge of a cliff, providing its visitors with amazing views of the park. 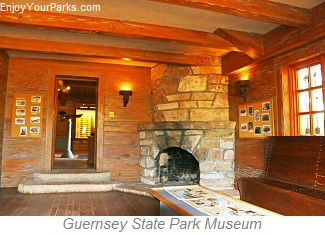 Historic Guernsey State Park Museum in Wyoming is a National Historic Landmark. In addition to the Guernsey State Park Museum as an example of the fantastic "Rustic Architecture" produced by the Civil Conservation Corp of the 1930's that is now a historic national treasure and is now registered as a National Historic Landmark, "The Castle" is definitely another incredible example of the phenomenal work by the CCC in this historic park. The Castle is built of stone, and has a huge fireplace and wonderfully winding stone steps that take visitors to an incredible observation area overlooking the park. Architects around the world are impressed on how "The Castle" perfectly blends and "fits" in its natural surroundings. 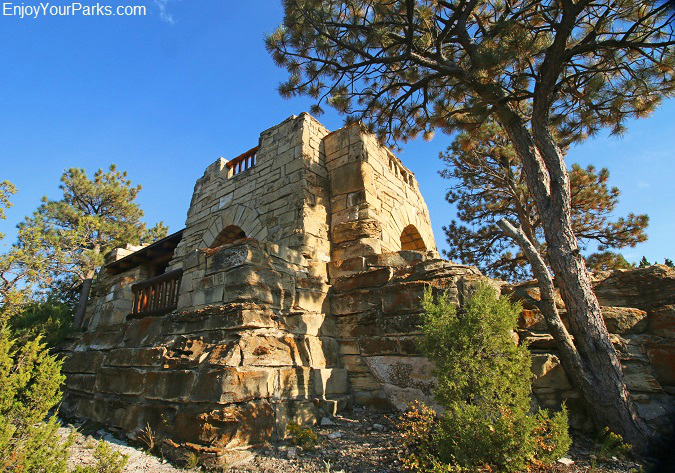 "The Castle" is a classic example of the CCC's "Rustic Architecture" found in Guernsey State Park. 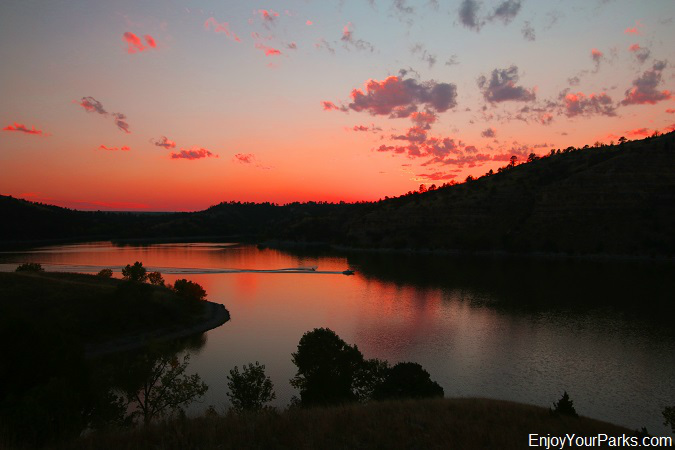 Sitting high above Guernsey Reservoir, Brimmer Point provides astonishing panoramic views of the park, and really is a "must see" while visiting Guernsey State Park. From Brimmer Point, there are also approximately 10 miles of the original CCC trails that were built in the 1930s, and are a wonderful place to hike and enjoy the beauty of the area. This is a view from Brimmer Point in Guernsey State Park of Wyoming. feature at the park, as visitors find them very enjoyable and provide stunning scenery and vistas. The trail system begins at Brimmer Point Turnoff, and they consist of a series of loops that give hikers great views of the surrounding area, as well as the Guernsey Dam and Guernsey Reservoir. The Bureau of Reclamation built a number of dams on the North Platte River, including the historic Guernsey Dam that was built in 1927. It is a two generator power plant has an historic and classic arch gatehouse. The Guernsey Dam controls river flow to help with irrigation for farmers and ranchers, as well as serves as an electric power plant. The Guernsey Dam is 135 feet high and was designed originally to hold about 74,000 acre feet of water, however this volume has been reduced due to silt deposits. 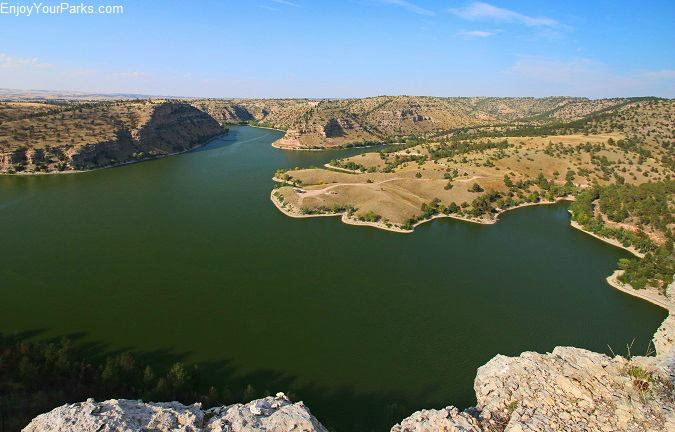 The reservoir is a popular place for many water sports such as boating and fishing, and is enjoyed by many visitors throughout the summer season. 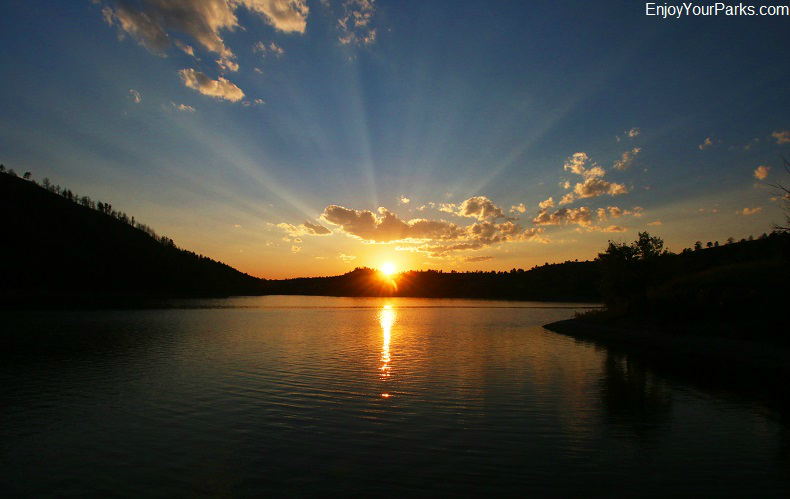 There are seven campgrounds located inside the Guernsey State Park, five of them are found around the lake. 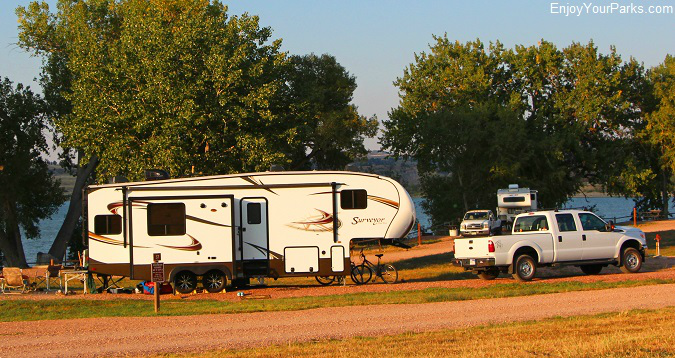 Each campground provides bathrooms, picnic tables, drinking water and fire grills. There is also a dump station located within the park. 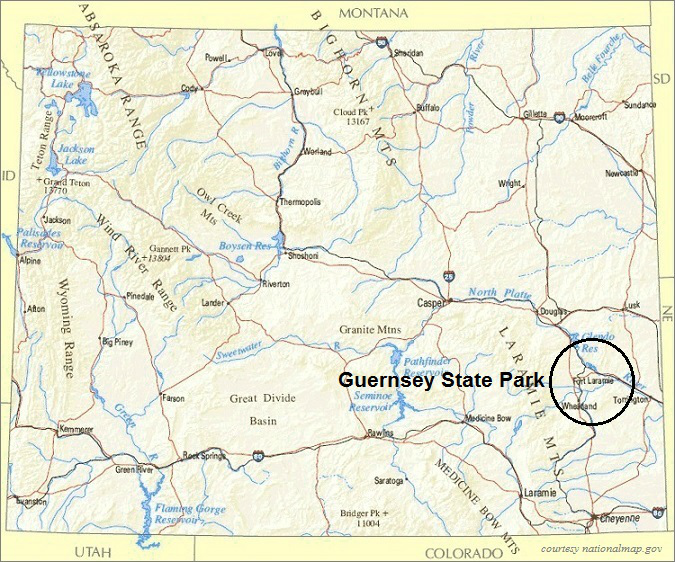 There are seven campgrounds located inside Guernsey State Park. The Oregon Trail Ruts National Historic Landmark is an absolute "must see" while you're in the area, and is located only a short distance from Guernsey State Park. The wagon wheels of all the thousands of covered wagons that used the Oregon Trail to go west, actually cut into the rock there, forever preserving this amazing trek. The Guernsey State Park Museum features the Oregon Trail Ruts National Historic Landmark, but we highly recommend that you go see them for yourself...these ruts really bring this amazing history to life. 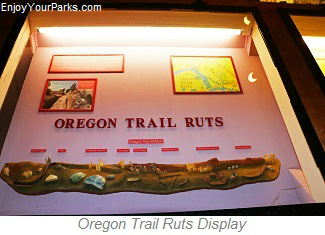 For all the details on the Oregon Trail Rut National Historic Landmark, CLICK HERE. 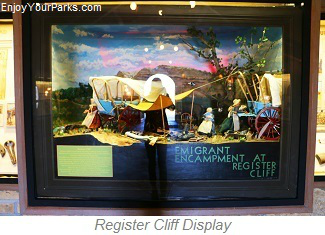 Register Cliff State Historic Site is another close by "must see" while visiting this area. Thousands and thousands of pioneers heading West along the Oregon Trail carved their names into a large sandstone cliff. This place was where the wagon trains would rest for a few days before making their way up to South Pass as they crossed the Continental Divide. While they rested, they had plenty of time to carve their names into the stone... and thus left their mark for the ages. We highly recommend that you spend some time here...you'll be very glad you did! 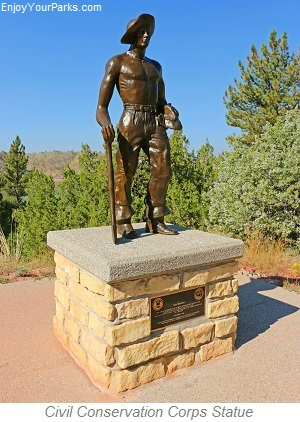 For all the details on the Register Cliff State Historic Site, CLICK HERE.